Stomp Grip is a textured, tacky rubber pad that sticks to the side of your tank. It’s shaped to fit individual bikes, and the idea is that it lets you connect with the bike better. In particular, it’s for ‘hooking onto the tank’ in the way that the California Superbike School teaches. I have to admit to being dead cynical about this stuff at first, much as I was about CSS before I went through their coaching. I fitted a set to my tuned GSX-R1000 K4 race bike. If I was going to need help holding onto anything, it would be this thing. Now I’m hooked (sorry, crap pun). Stomp makes a massive difference to how effective you can be with your legs in controlling the bike and, crucially from a CSS view, keeping it stable. I found I can grip the tank under braking to relieve load on my arms, in turn giving me more steering control, and I feel more connected to the bike during hard cornering and rapid direction changes. 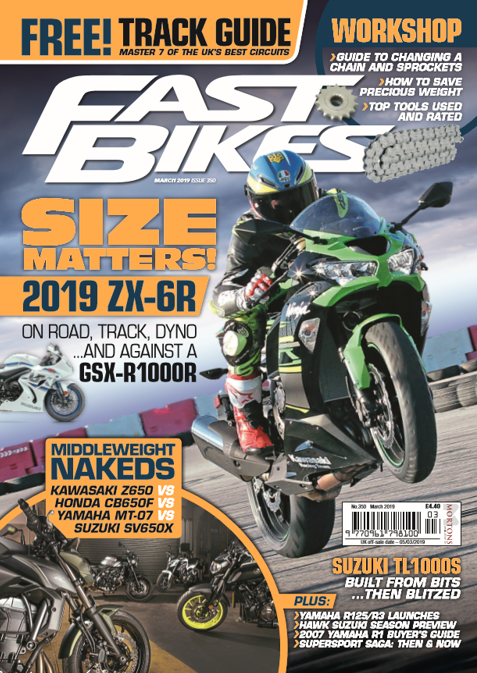 I don’t think it’s necessarily worth fitting to your GSX1400 for two-up outings with the wife, but if you have a ZX-10R and ride like you’re practicing for the TT, then you’ll definitely appreciate the difference.